The design language and the specification level harmonised more closely with the larger Volvo V70 estate car. The aim was to give customers large-car properties in a compact format and with clearly sporty overtones. The Volvo V50 has a design with a curved roof line and an abrupt tail section. The car’s appearance speaks modern design and speed. This is emphasised by a rounded nose section, short bonnet and pronounced cab-forward stance. Broad haunches and convex side panels signal power and underscore the car’s compact dimensions. The tail lamps follow Volvo’s modern form and sweep up towards the roof panel. Despite its compact exterior dimensions, the Volvo V50 offers a spacious and flexible interior. Every passenger seat has a fold-flat backrest. With the seats folded down, the load compartment floor is entirely flat. In order to create even more space for luggage, the car’s rear section has been extended by 46 mm compared with the Volvo S40 sedan model. The Volvo V50 is designed and equipped to impact as little as possible on the global environment and to offer a clean and healthy interior climate. Petrol engines with low internal friction, efficient combustion and advanced exhaust filtration technology result in low emissions. Energy-efficient diesel engines with particle filters produce low emissions of carbon dioxide and soot particles. 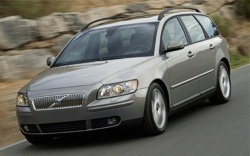 In addition, the Volvo V50 is available on the Swedish market with an ethanol-powered FlexiFuel engine. The five-cylinder versions of the Volvo V50 can be optionally specified with a catalytic radiator coating – PremAir®. This system converts harmful ground-level ozone into pure oxygen as the car drives. Its benefits are greatest in dense city traffic and in strong sunlight.